In 1949, when Scottsdale (population 200) was not yet the rah-rah Scottsdale that we know, a Chicago area businessman traveled west to look over the land and to consider the western way of life. He found wide-open spaces, miles and miles of dirt roads, hitching rails in front of the few businesses, palm trees here and there, road signs that proclaimed, “Horses have the right of way,” an abundance of cactus, cowboys (real, not dudes), and hundreds and hundreds of acres of raw desert land. In this setting, Ed Tweed found what he was looking for — 160 acres of desert with a mountain range in the background and a price tag of 50 dollars per acre. Here Ed could develop the reality of his dream — to own a farm and raise fine livestock. Ed had had a few Arabians earlier, and now he was ready to become a serious breeder of Arabians. First step was water. A 900-foot well provided the first greening of the land; then a lake was enlarged (the lake said to be the miscalculation of the well-drillers) and decorated with a large aviary of exotic birds, its own island, a rustic bridge, and willow trees. Soon horse pastures were evident. A handsome Spanish stable was built, then a Tweed-designed large hacienda-type family home. Every hinge, door, and beam bore the mark of Mr. Tweed’s insistence on the finest craftsmanship and quality. The name Brusally Ranch came easily as a combination of Ed and Ruth’s children, Bruce and Sally. Then came the Arabians. Mr. Tweed bought the champion Skorage (Gaysar x Rageyma by *Mirage) from Dan Gainey, then in 1963, Tweed sent his agent (and trainer) Steve Spalding to Poland to shop. He’d been pleased with his foals sired by *Muzulmanin (Doktryner x Mufta by Mlech Pelkinski), 1963 Scottsdale Champion Stallion and later 1967 U.S. National Champion English Pleasure. Steve made his early choices, then filled the cargo plane with more Polish mares. “We only intended to buy five or six, but the plane held 14, so we bought 14,” Ed explained. He admired the Polish breeders and appreciated the well-balanced, athletic horses they consistently turned out. Seemed a good outcross for his Skorage daughters too. The Polish purchase included two stallions: a *Naborr son *Gwiazdor and a Comet son *Czester; mares were daughters of Comet, Trypolis, Doktryner, *Naborr, Faher, and other worthy Polish sires. By 1957, the Tweeds began looking for an escape from the summer desert heat. They found it in Pinon, a ghost town in the White Mountains near Show Low. Ed found great pleasure in restoring the entire town (down to its tiny post office) to its territorial days. Horses were brought in from the Scottsdale ranch, and the Tweed family’s summer days were given to riding, hand-cranked ice cream socials, barbecues, visiting with the few neighbors, and exploring their new area. Back at Scottsdale, the Tweeds were occupied with their Arabians and new ways to promote them. An Arabian horse club seemed fitting, and Ed organized it and was elected its first president. In that role, Ed hosted the now-fabled tack room meeting with some of the few Scottsdale owners of Arabians — Anne McCormick, Mrs. Philip K. Wrigley, the Wrigleys’ trainer Joe Dawkins, and Harold Daugherty (manager of Brusally). 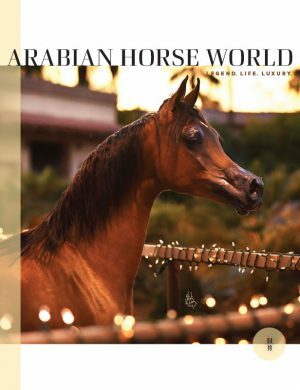 They saw a need for an event that the horse world would notice: an exhibition of local Arabians. Ed announced the event from the bed of a truck, as the locals were presented in a variety of works, from native costume to English pleasure. Spectators loved the versatility and beauty of the breed, and their enthusiasm persuaded the tack room group to produce another event. This time they decided on a 1955 full-blown all-Arabian show. The Tweeds, the Philip Wrigleys, and Fowler and Anne McCormick each contributed $1,000 for show expenses. Premium lists offered $2,000 in prize money, and 136 Arabians competed for those dollars. The press was supportive: “All-Arabian Opening Attended by 3,000.” A success it was and, more than 60 years later, a roaring success it still is. In the total look of breed shows, the Scottsdale Arabian show is recognized for its global prestige. Scottsdale wins on an Arabian resumé have helped propel many a winner to national and international recognition. When Ed retired, he gave his granddaughter Shelley Groom Trevor her choice of 12 Arabians to do with as she wished. Shelley kept Brusally functioning, and she maintained the Brusally reputation for unending hospitality, show trophies and ribbons, and the production of top Arabian horses. Ruth Tweed died in 1971, and after her death, problems weighed heavily on Ed. Shelley spent long hours with her grandfather, assuring him she would carry on his dreams. In 1976, Ed suffered a paralyzing stroke and was bedridden for seven years, but, says Nancy Reidhead, a Brusally employee and family friend, he never lost his gentlemanly manner, his gracious hospitality, or his sense of humor. Ed died in June 1983. He’d contributed greatly to the appreciation of the usefulness of Polish bloodlines, and he never stopped promoting the Arabian breed — from store openings to television appearances to the racetrack. The 1965 show season with Shelley showing in a variety of disciplines added much to the already-bulging trophy shelves at Brusally. Shelley excelled in many disciplines and found great satisfaction in competing in working horse classes, riding Jo Lad (Malastra x Djouhera by Khalek) and *Centaur (Comet x *Sabaa by Wielki Szlem). When Shelley ended her competitive years, her artistic skills (painting, sketching, design) gave her another perspective on horses. As in showing, she excelled and was often seen during the Scottsdale show with her many projects. Writing of her many years with horses brought her new recognition. Then, as Shelley wrote, “A tall elegant Englishman danced into my life,” and became her husband. Elleston Trevor, a well-recognized writer, soon learned about Arabian horses, and Shelley learned about his writing career and his fictional super-spy “Quiller.” Sadly, Elleston died in the late 1990s. Yes, Brusally is gone, the welcoming entrance gate is no longer in place, and the horse pastures now comprise the greens of the Scottsdale Country Club. But the Tweeds’ enthusiasm and promotional efforts will always remain as background for the Scottsdale show and its many spin-offs. Here are comments from people who knew Ed and Ruth Tweed, their family, and their Arabian horses. Now what could touch your heart more than to see a graceful young lady on a beautiful horse and to know that you had contributed a little something toward the creation of both. — Ed Tweed watching his granddaughter (Shelley Groom Trevor) show a Brusally Arabian.